The BMW community has an overwhelming love for our VAC Floor Mount Adapters; they have been a best selling product for years with hundreds of happy customers. Due to popular demand we will be making more applications available, and in our first expansion into Porsche, the 964! Developed for one of our customers and his beautiful 911 RS America, these adapters are the best way to install a sport or racing side-mount seat you will find offering a customized fitment for driver preference and seat alignment. 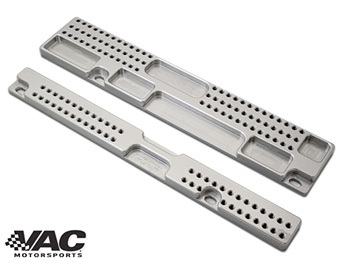 VAC Motorsports CAD designed and CNC machined Billet Aluminum Floor Mount Adapters allow lowest install of any seat bracket available. Picture is example only, but is a close representation to the 964 application. Race Seat Side Mount Brackets (Universal) – Check out our awesome side mounts!